From the author - Gossip columnist and single New York City girl Mel lives in the most exciting place in the world, yet she's bored with her lovelife. But things get interesting fast when the old lady next door is nearly murdered. Mel starts paying closer attention to her neighbors—what exactly is going on with the cute boy next door? Has Mel found the love of her life—or a killer? Ooh la la this girl gets some action (but it's not too descriptive. it's tasteful). I would read this book from the comfort of your own home, especially because of "Parker's Return - Chapter 17" ;). Whatever mood you start this book in, you will end it with a huge smile on your face. This book is filled with laughs from beginning to end, mostly because Mel, the main character, embarrasses the hell out of herself all the time. Main Character - yay or nay? Mel is such a cutie pie. Yay yay yay. At some points, she may be a little too "omg did that happen to little old me? *bats eyelashes suggestively*" but at the end of the day, this girl can catch a murderer, find love, and look killer in a pair of heels. Now if only she could get to work on time. John Trent is a sweet, caring, rich, successful, down-to-earth guy who's good with kids. Clean up on aisle 5, I just started drooling a little. If you can look past his kinda (okay, a little more than kinda) crazy family, he is the perfect guy. Bonus: did I mention he's rich? Because when I say rich, I mean rich to the power of rich multiplied by rich. Not a bad bonus, eh ladies? Everyone in the book is a character worth mentioning. Meg Cabot has a way of writing characters so that you care about the security guard you see for ten seconds. They are all fabulous (especially Dolly Vargas. She cracks me up) and you'll fall in love. I don't know if this counts but I thought I'd mention it. The book is written in a format where you just read emails exchanged between characters. May be a little confusing at first but you'll get the hang of it. The cover fits; it's cute just like the book. This is just a fun read about a girl who has great friends and meets a great boy so of course I needed to choose a fun song. Spice Girls - Wannabe! 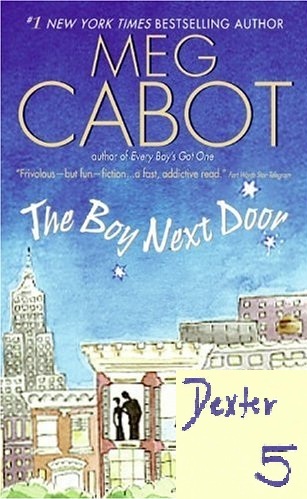 This is the first book in a series Cabot calls the "Boy" series. The second one is "Boy Meets Girl" and the third one is "Every Boy's Got One." The main characters of each book are different but you'll still see the same background characters. I recommend every book. I think I might have gushed just a little too much but I'm definitely rating this book a 5. This book may not give you the insight into the meaning of life but it will sure as hell entertain you. I can truthfully say that I have read this book at least 40 times and I could read it another 40 times and not be sick of it. A must-read. Thanks! You are a faithful reader and it's amazing that you are. Thank you, thank you, thank you. We're trying our best to keep up the reviews for readers like you.